Welcome to the ODBD April New Release post and Blog Hop showcasing projects from Our Daily Bread Designs April Release! You can see all of the April Releases here. Continue reading below to find out how you can win one of three $25 Gift Codes to the ODBD Website! ODBD has many fabulous 3D dies, the newest one being the beautiful Luminous Lantern die. This die set and be used with our with out the decorative inset panels and depending on which base you use, the lantern can be either four or five sided! My first project features the Luminous Lantern along with a coordinating card to create a gift set. For a complete supply list, please see the details below. Here's another photo of the Luminous Lantern. The flowers on both projects are created using the Roses and Rose Leaves die sets. 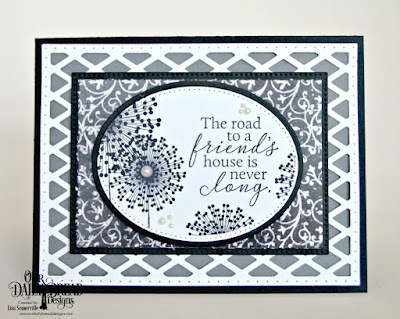 My next card features the stamp set To My Friend, along with the new Lattice Background Die. Three randomly selected winners will each receive a $25 gift code to the ODBD Website just for commenting on the Design Team cards! You have until April 2, 2017 at 9:00 p.m. EDT to leave your comments. The Winners will be posted April 3rd, on Our Daily Bread Designs Blog, so be sure to check back there to see if you won! I love the landscape card. I like the monochromatic use of colors that invite you to search out the whole card instead of being focused on one element. I love the gift set lantern and card. The monochromatic card is striking! Thank you for sharing the ideas. These are so beautiful. I can't even choose which project I like best. Those flowers are gorgeous. The colors of your pieces are very eye catching. You had me at the color in that gift set -- it's beautiful! Love your card and lantern. The flowers are beautiful. Great mono card, too. Gorgeous set--love the colors. Pretty lattice friend card too. pretty color combo on the lantern and roses. Pretty card! Your gift set is gorgeous deluxe! 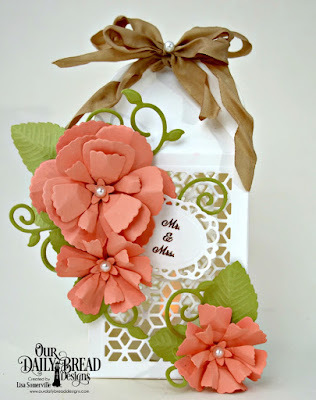 Love the lantern and roses dies! Fabulous use of dies on your lattice card! Beautiful!! that lantern really is stunning and I love the peach roses you created! And that black and white card is just gorgeous!! that black and white/gray one is gorgeous. Man I love that lattice die. 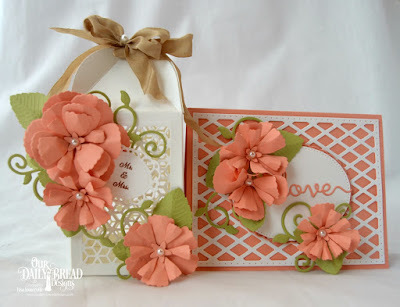 Hi Lisa...wow...beautiful cards and the box too...love the peach colour..and the dandilions are awesome too!! Lisa these are gorgeous! 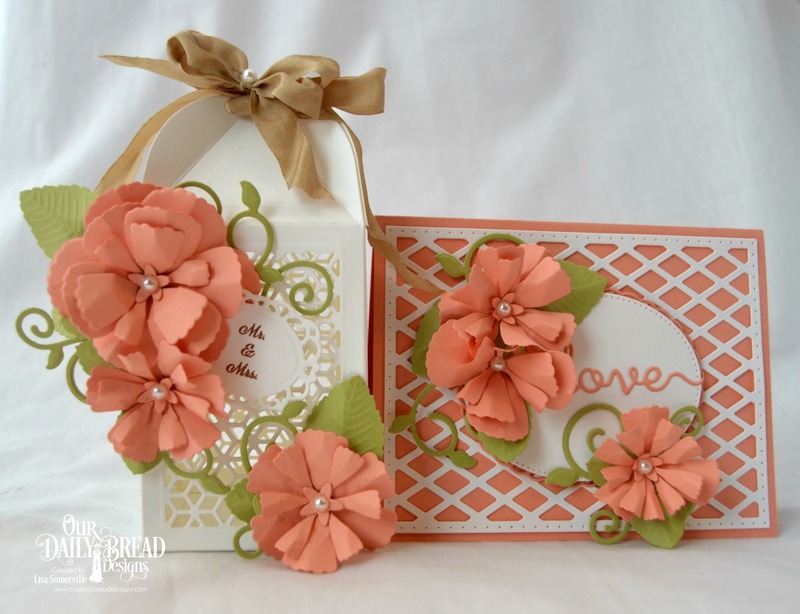 Love the peach lantern/card set with those beautiful roses!! I absolutely love that black and white card - so crisp, classic and elegant! Stunning work!! Lisa, your cards and lantern are so beautiful. I love the colors you chose. Beautiful lantern/card set, Lisa! Lovely color combo!! I LOVE the monochromatic card!! What a gorgeous gift set! Your color combo is so soft and beautiful! It's fun to see the rose die used to create a different version of flower. It just makes the die that much more versatile. I love your beautiful creations and choices of colors used, I have been using these colors myself lately...so very gorgeous!! Your projects are beautiful! I especially love your matching gift set with the lovely colors! Your card and lantern are beautiful. I'm really like the flower stamp set. Beautiful lantern and card ensemble, and your dandelion card is lovely! The lattice background, layering and pretty dandelions from the To My Friend set make a fabulous combo! Beautiful card and lantern set. The flowers are fabulous. Love the lattice background. The second card is lovely. Such pretty projects! I especially like the sentiment tag on the second card! I love the layering techniques on the gray and white card. Very lovely. Your creations are beautiful, Lisa! I love the peach and white combo!! So much texture! 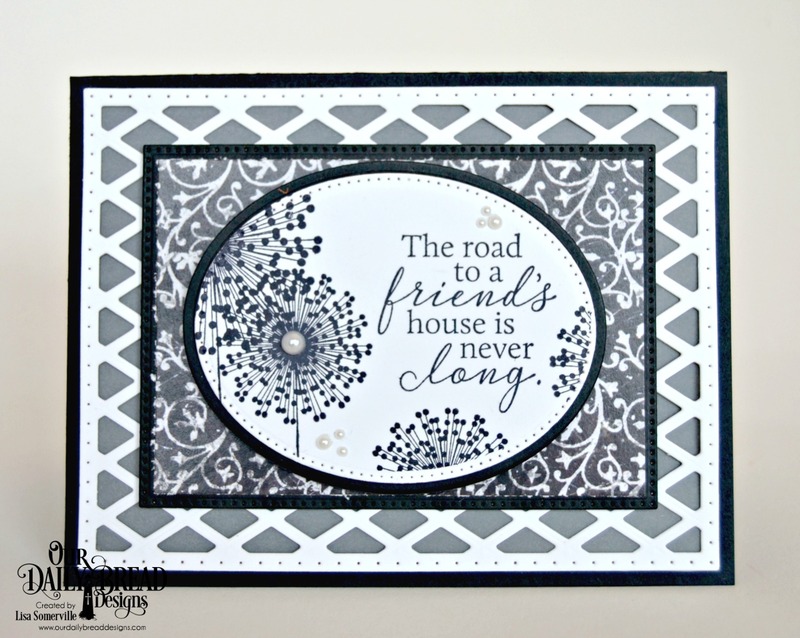 The last card with the lattice background and the "to my friend" stamp set is gorgeous! Both projects are beautiful Lisa! I love the white lantern with the peach flowers, and I especially love the second card... the soft color combo is striking. Gorgeous card and lantern set, Lisa. Love the peach and white colors. And your dandelion card is simply adorable, too. Love them all. Oh I love the lantern and the matching card! So pretty! The dandelion card is fantastic! Lisa, love the lantern/card set as well as your To My Friend card! Perfect details as always- hugs and I hope you have a blessed Easter week!